The Refuge is located within a gated community, which provides an exclusive impression when it comes to the beautiful lake views, Majestic desert scenery and the magnificent sunsets.. Located within this community are custom homes, semi-custom homes and sites that are available to design and built your very own dream home. 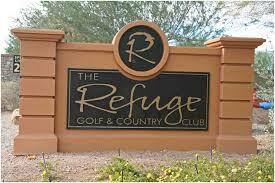 The refuge home are nestled among the natural desert beauty and the rolling greens of the golf course. They also have access to the zero-entry infinity-edge pool, bar included overlooking the practice range. This golf course is a pleasure to play on with its gorgeous lake and mountain views. The course also provides an excellent degrees of difficulty from the novice golfer to your veteran player. The pro shop provide professional lessons and practice areas to perfect your game. They also provide the latest up to date clothing and golf equipment for even the choosiest players. The clubhouse Bar and Grille serves Breakfast, Lunch and Dinner and can be enjoyed in their stunning indoor dining room or relax at their charming outdoor patio area. Both places you will be able to appreciate the exquisite scenery all year round. The fitness center provides state of the art equipment which include stationary bikes, treadmills, elliptical machines, weight machines and free weights.